Blue Bridge lending programs ​assist underserved and ​specialized industries with funding that is often difficult to get through traditional lenders. We offer our professional business customers unparalleled services and industry experience. Our ​loan ​programs can be customized to fit your needs,​ and ​any equipment ​required for your business operation is eligible ​for financing​. No Application Fee. No Obligation. 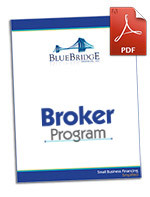 Financing through Blue Bridge is a smart and easy business decision. We are experts in equipment financing and will walk you through every step of the process. Get started by applying today and you will have a decision within 4 business hours. Once approved, we’ll provide the funding for your purchase in as little as 24 hours. Business owners have a greater success rate with Blue Bridge Financial. Funding for businesses of all industries, sizes and credit history. Financing available from $5,000 to $500,000. Repayment plans ranging from 36-60 months. Simple applications. Fast decisions. Monthly payments. No application fees. No hidden fees. Complete transparency. Friendly service and personalized consideration. Blue Bridge Financial is a preferred vendor for America's Best Value Inn, Canada's Best Value Inn, Lexington, Jameson, Country Hearth, 3 Palms, and Signature Inn brands. © 2017 Blue Bridge Financial, LLC. Interested in our Broker Program? To download our rate sheet and broker program details, please enter your information to the right. Thank you. Please check your email to receive your download.